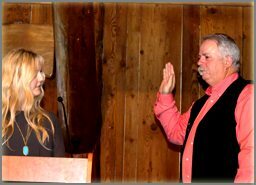 Salem native and fourth generation Realtor® George Grabenhorst has been installed as the President of the Oregon Association of REALTORS® for 2017. His term of office officially commences in November. Grabenhorst has been in the real estate business for 28 years. Most recently he is a Senior Advisor with SVN Commercial Advisors in Salem. Prior to that Grabenhorst owned and operated Grabenhorst & Associates (previously Grabenhorst Bros.) for many years. The family real estate business first opened in Salem in 1910. Grabenhorst is a two-time Past President of the Salem Association of Realtors® and a two-time Salem Realtor® of the Year. He has been active with the statewide Oregon Association of REALTORS® for many years, serving on numerous committees and boards. “I like to be busy,” says Grabenhorst. “I feel I’m more productive the busier I am. Grabenhorst’s installation, at the recent OAR Convention in Sunriver, was a family affair and continues a unique family tradition. He was formally installed by his daughter, Alisha Rae Grabenhorst. His uncle, Coburn Grabenhorst, was the OAR President in 1957. The two Grabenhorsts are believed to be the only two primarily commercial brokers to attain the OAR presidency. Grabenhorst lives on the 110-acre family farm in South Salem he grew up on with his wife, Sunny Lyons. He specializes in land, industrial, commercial and agricultural properties. Away from the office he works on the farm, raises horses, is an avid outdoorsman, model airplane builder, golfer and has a passion for U.S. history.